VELCRO ® Brand Pressure Sensitive Hook & Loop Tapes: Pressure sensitive pre-coats are popular because of the ease of application. Simply remove the release film and press VELCRO® Brand tape in place. VELCRO® Brand hook and loop fasteners are the most highly recognized product components known worldwide for consistency and quality. We have large quantities of pressure sensitive tapes in three colors, White, Black and Beige. Just peel the tape and apply. It's that simple! Our Pressure Sensitive tape is backed with a acrylic adhesive (0172) great for high temperature performance and superior bond. We also stock P/S 0115 & 0119 on 3/4, 1 & 2" widths. 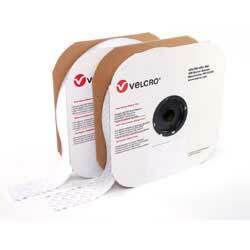 VELCRO® Brand Cut & Mated sets 900 ct.